Washington (AP) – Alberta’s unusually early and large fire is just the latest of many gargantuan fires on an Earth that’s grown hotter with more extreme weather. Earlier this year, large wildfires hit spots on opposite ends of the world – Tasmania and Oklahoma-Kansas. Last year, Alaska and California pushed the U.S. to a record 10 million acres burned. Massive fires hit Siberia, Mongolia and China last year and Brazil’s fire season has increased by a month over the past three decades. It got so bad that in 2009, Australia added a bright red “catastrophic” to its fire warning index. “The warmer it is, the more fires we get,” said Mike Flannigan, a professor of wildland fire at the University of Alberta. Last week, temperatures pushed past 90 degrees Fahrenheit (mid 30s Celsius) in Alberta, which is unusual for May in northern Canada. It’s not quite so simple though. Many factors contribute to the complex increase in big fires, Flannigan and several experts said. They include climate change, the way people use land and firefighting methods that leave more fuel – trees and brush – to burn. But the temperature one stands out, Flannigan said. 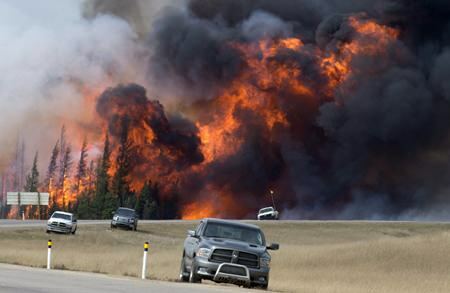 “The Alberta wildfires are an excellent example of what we’re seeing more and more of: warming means snow melts earlier, soils and vegetation dries out earlier, and the fire season starts earlier. 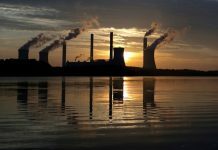 It’s a train wreck,” University of Arizona climate scientist Jonathan Overpeck wrote in an email. Worldwide, the length of Earth’s fire season increased nearly 19 percent from 1979 to 2013, according to a study by Mark Cochrane, a professor of fire ecology at South Dakota State University. Fires had steadily been increasing, but then in the late 1990s and early 2000s, “we’ve suddenly been hit with lots of these large fires we can’t control,” Cochrane said. For the entire U.S., the 10-year average number of acres burned in wildfires has more than doubled from about 3 million acres in the mid-1980s to 7 million acres now, according to an analysis of government data by The Associated Press. “Globally we are seeing more fires, bigger fires, more severe fires,” said Kevin Ryan, a retired U.S. Forest Service scientist who is now a fire consultant, with a recent stint in Indonesia, where fires were big last year. Fires in some places, such as Indonesia and Canada, are bad when there’s an El Nino – a warming of parts of the Pacific that changes weather worldwide – because it triggers drought in those regions, Ryan said. In Indonesia, changes in land use are a bigger factor than climate, Ryan said. But elsewhere, it’s temperature and moisture, too much of one and not enough of the other, scientists said. As the air warms, it gets “more efficient at sucking the moisture out of the fuels” which makes them more prone to burn, Flannigan said. Then add in lightning. A study found that lightning increases 12 percent with every degree Celsius and that can trigger more fires. Flannigan said there’s evidence of fire-triggered clouds in Alberta causing at least two more fires because of lightning. The U.S. National Academy of Sciences earlier this year in a study determined that “climate warming has resulted in longer fire seasons.” But other factors, such as the way fires are fought and land use, make it difficult to scientifically attribute individual fires and regional fires to climate change, the report and other scientists said. “This is absolutely a harbinger of things to come,” said Canadian climate scientist Weaver, now a Green party legislator in the British Columbia parliament.